I saw them as they marched by my front window. A small group of what appeared to be approximately 15 retirees making their way up my block in Hoboken, N.J., this past October. Normally this happens only when parishioners from nearby St. Francis Church process through the neighborhood during their annual feast. But this group was heading in the opposite direction, so it caught my attention. I stepped outside to take a look and found them standing up the street listening to a tour guide. They were congregating in front of an empty parking lot at 415 Monroe Street, but the average passerby would not know that, as there isn’t any sign. A parking lot doesn’t generally have an address sign—even when it is the site of the birthplace of an American icon like Frank Sinatra. Nothing remains after a fire in 1967 destroyed the four-story tenement building where Sinatra was born a century ago on Dec. 12, 1915. 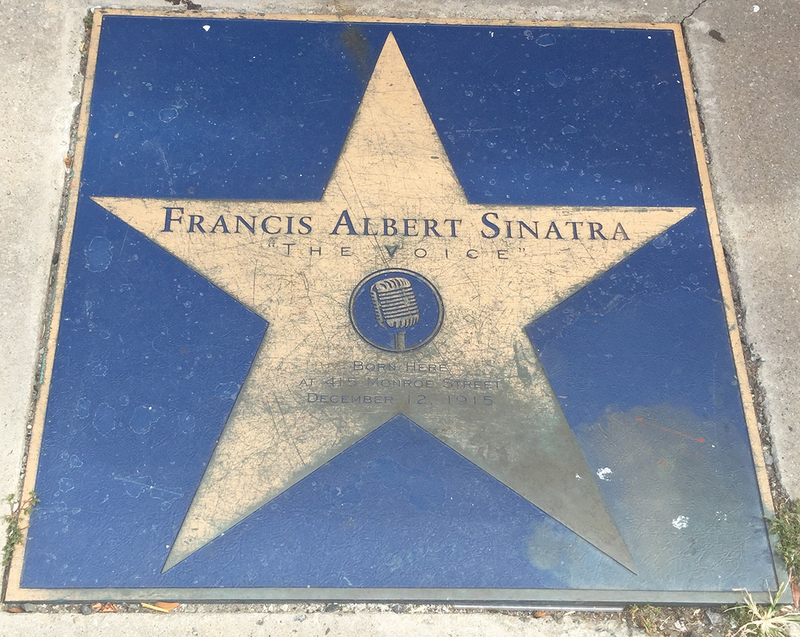 A scuffed and fading gold and blue star in the pavement—paid for by a local businessman in 1996—and the “From Here to Eternity” museum next door (closed since 2003) are the only indications that one of the 20th century’s greatest artists was born and lived the first 12 years of his life there. The whole scene is sadly indicative of the complicated relationship between Sinatra and Hoboken: slightly discarded, slightly ambivalent but set in concrete. When I moved to Hoboken from Brooklyn over 20 years ago, it was for musical reasons that had absolutely nothing to do with Frank Sinatra. A thriving music and arts scene had flourished in Hoboken since the late 1970s and helped turn around the fortunes of this Mile Square City after it had fallen on hard times in the mid-20th century. For a newer generation, the town’s cultural life centered on Maxwell’s, a legendary club that helped nurture countless artists like R.E.M., the Red Hot Chili Peppers and Nirvana. It was an alternative and indie hub long before those words became part of the cultural lexicon. My knowledge of Sinatra at the time was pretty much limited to parodies of the aging legend on “Saturday Night Live.” Both Phil Hartman and Joe Piscopo did hilarious impersonations that portrayed the latter-day Chairman of the Board as a tough-talking, no-nonsense artifact from a less culturally sensitive and politically correct time. As a struggling young musician, artifacts like Sinatra were not particularly interesting to me. The truth is, anything recorded before Buddy Holly or Little Richard might as well have been ancient history. But that, of course, is the blessing and the curse of pop culture. At its loftiest it can erase distinctions between high and low culture as well as entertain, educate and nourish us. At its worst, it flattens time and history and reduces everything to a series of disconnected, disposable moments. Without sufficient time and context, we have no perspective and no ability to assess something’s lasting value. And yet Sinatra has stayed with us. This year alone there have been a four-hour HBO documentary, “Sinatra: All or Nothing At All,” a traveling exhibit called “Sinatra: An American Icon,” as well as album reissues and a number of film festivals. If the retrospectives marking the centennial of his birth have done nothing else, they have made the case for Sinatra’s lasting greatness and cultural impact. Over the intervening years since his death, the sensational aspects of his life that made headlines—the womanizing, the marriages, the supposed mob connections—have receded in importance, and what we are left with is the only thing we can judge him on: his music. One of the most astonishing aspects of HBO’s Sinatra documentary is the audio and television interviews with Sinatra himself. Drawn from every phase of his long career, they are peppered liberally throughout. Listening to Sinatra speak—his attitude, rhythm, diction and language—it is as if an archetypal mid-20th-century American male has sprung from the pages of a Damon Runyon story. AMC’s “Mad Men” in many respects felt like a love letter to Sinatra’s style and postwar model of American manhood. The swagger of course would mean nothing were it not for his singing. His vocal style and ability were definitive enough in his own time to earn him the nickname The Voice. Armed with the finest music from the Great American Songbook, Sinatra could crawl inside a song and make it his own, conveying heartbreak and strength in the same moment. So prodigious was his gift that his impact extended beyond singers. Jazz musicians selected him as “the greatest-ever male vocalist” by an overwhelming margin in a 1956 poll, and no less a legend than Miles Davis cited Sinatra’s vocal phrasing as an influence on his trumpet playing. Perhaps that is what we continually return to? Maybe on some level we see behind the man in black-tie sophistication and realize that he is ultimately just like us: wounded and lonely but still alive and on his feet. Sinatra invites us to participate in an act of the imagination in which we are aware of our limitations and yet, at the same time, believe that we are not defined by them. It is an act of transformation not all that unlike conjuring life out of battered pavement and an empty lot. I would still rather listen to Nat Cole. This article also appeared in print, under the headline "Sinatra’s Century," in the December 7-14, 2015 issue. Bill McGarvey, a musician and writer, is the author of The Freshman Survival Guide, owner of CathNewsUSA.com and was the longtime editor in chief of BustedHalo.com. Twitter: @billmcgarvey.